↑ That these undisputed dates (the first half of the Olympiad year 384/383 BC, and in 322 shortly before the death of Demosthenes) are correct was shown already by August Boeckh (Kleine Schriften VI 195); for further discussion, see Felix Jacoby on FGrHist 244 F 38. Ingemar Düring, Aristotle in the Ancient Biographical Tradition, Göteborg, 1957, p. 253. ↑ MICHAEL DEGNAN, 1994. 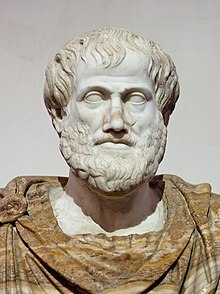 Recent Work in Aristotle's Logic. Philosophical Books 35.2 (April 1994): 81–89. ↑ Corcoran, John (2009). "Aristotle's Demonstrative Logic". History and Philosophy of Logic, 30: 1–20.